A COMPANY. Submitted by WX16572 Neil MacPherson (3 Platoon, A Company, 2/2 Pioneer Battalion). On February 28th, the day large numbers of Japanese were landing on the north coast, where both the cruisers HMAS Perth and USN Houston were engaging the landing force, and were subsequently destroyed, the Pioneers took over the defence positions at the Llewiliang bridge. A Company were held in reserve back at the asylum, the 2/3 Machine Gun Battalion, without their machine guns but with commandeered weapons, took up position on the left rear of the bridge defences. Also part of the defending force was the 131st Field Artillery Company (United States Army), these Americans and those off the U.S.S. Houston were later to spend the rest of the war as prisoners with the Australians. Just two Australian battalions with a mixed battalion made up of Australians escaping from Singapore and inexperienced reinforcements en route to Singapore to oppose some 60,000 Japanese. In the series Australian In the War of 1939-45, “The Japanese Thrust” on page 497, Wigmore describes the Japanese final thrust for the biggest prize of the whole campaign : Java, with all its treasures Oil, Minerals, Rubber, raw materials. It would seem that their plans had envisaged a defence force involving two Australian battle hardened Divisions, not an ad hoc brigade of three under equipped battalions, one made up of remnants from Singapore and fresh recruits from Australia. The two invading forces involved the Eastern Force consisted of the 48th Division, which had captured the Philippines, and the 56th Regimental Group that had captured Balikpapan were contained in a Naval force of 41 Transports. The Western Group consisted of the 2nd Division from Japan and the 230th Regiment of the 38th Division made up of 56 Transports. Java itself had little in the way of defence, most of their army had been spread thinly over its out lying possessions Timor, Ambon and Borneo where they were soon over whelmed by a superior and better equipped force. A large proportion of the Dutch army consisted of native troops who, on seeing what had happened in other areas, soon deserted and melted into the population leaving their Dutch officers and NCOs without resources to resist the invasion. 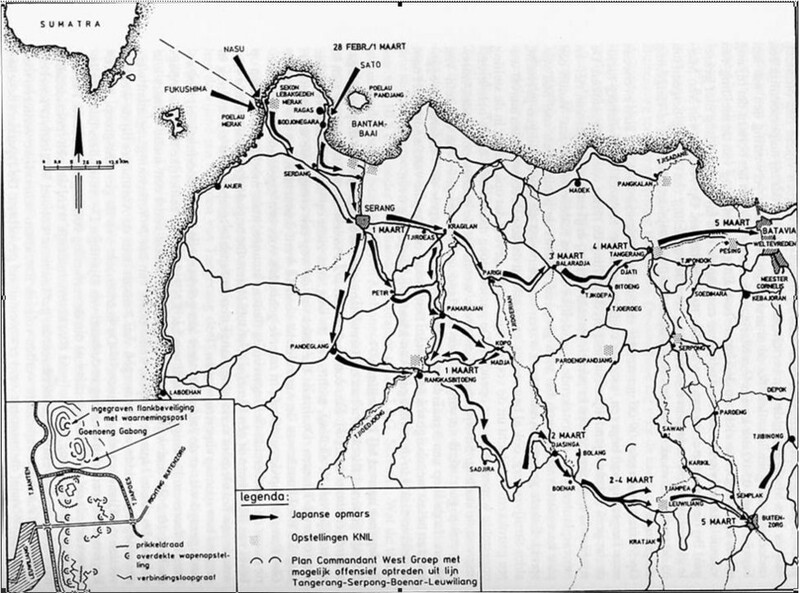 From the map shown below, the speed of the Japanese advance from the landing areas to the capital Batavia was spectacular, not only that but communications were non existent, the following is part of the 2/2nd Pioneer Battalion history book. At Llewilliang Bridge 4th March 1150 hours, a Dutch army intelligence report relayed by Headquarters Black Force in Buitenzorg stated “No Japanese landings on Java”. At 1155 hours, five minutes later, five Japanese light tanks approached from the west to inspect the bridge. The forward Companies reaction was spontaneous, two of the tanks were disabled by the fire of anti tank rifles from No. 10 Platoon locality. The presence of the Japanese advance guards in the area was a complete surprise, but it was learned later that large enemy forces had swarmed ashore at Bantam Bay in north-west Java on the 1st March and the 150 miles advance to Llewiliang area had been made without meeting opposition. 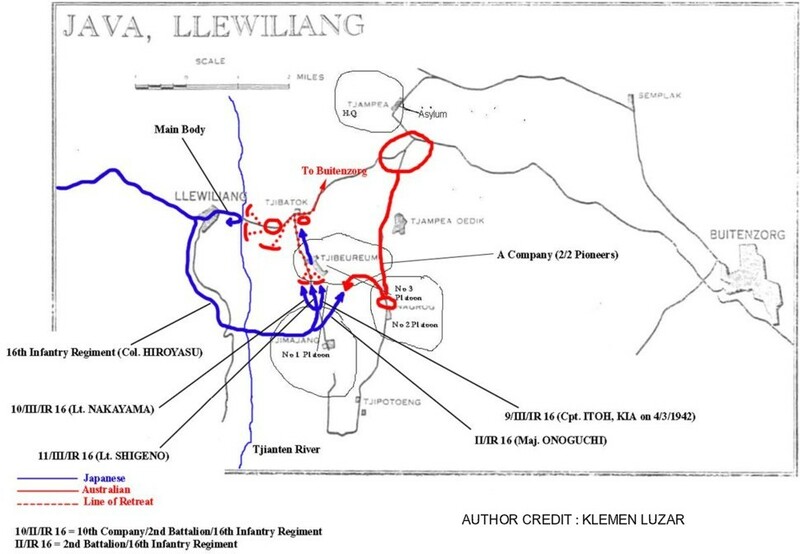 As can be seen on the map of the Llewiliang area, on meeting opposition the Japanese forces outflanked the small allied force, who were greatly outnumbered. As seen from the map shown below, the position held by C Company of the 2/3rd Machine Gun Battalion became untenable when the encircling Japanese troops attacked the hillock, it was then that A Company of the 2/2 Pioneer Battalion held in reserve were sent in to meet the Japanese attack. It is only now after translating Japanese battle reports that we find that the one platoon of Machine Gunners and the three platoons of Pioneers, a total of just over 100 men faced a full regiment of battle hardened enemy troops. All three platoons of A Company of the Pioneers went into action against the encircling enemy. While this enabled the Machine Gunners to withdraw without further casualties, the price in dead and wounded Pioneers was high.